Winter’s coming: Make sure that you can always get your car started. Typical British winters inevitably bring with them cold and damp conditions, and it is during such times that motor cars can sometimes be reluctant to perform, or even to start at all. Of course, you cannot blame them, for if you had been sat outside all night in cold and miserable conditions in the open you too might be reluctant to get started in the morning. So I offer the following advice which may help, whether your car is a recent model, a classic or anything in between. How good is your battery? This one is fine but it’s wise to have the battery checked before the weather gets reaally cold. This is bad enough on older vehicles but in the case of many modern cars, low battery voltage is a very bad idea indeed since it can ‘spike’ or damage the Electronic Control Unit, or ‘ECU’. The same can happen if you attempt to ‘jump start’ a modern vehicle; the sudden rush of power through the system can do all sorts of damage, so, IN EVERY CASE be guided by advice given on this subject in the car’s handbook. In addition, get your battery checked (free of charge at most battery suppliers). 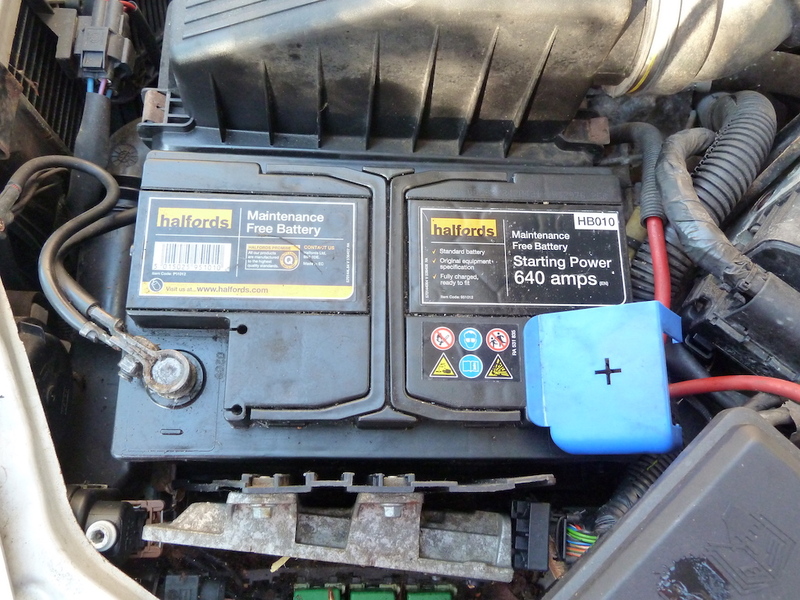 Note: Slow ‘trickle-charging’ of the car’s battery is always a better and safer bet than ‘jump-starting’, but of course time is required for the battery to build-up charge from a mains charger, etc. A good quality trickle charger is invaluable. For most older (i.e. generally pre mid-1980s) vehicles, ‘jump-starting’ using heavy duty jump leads can be tried without risk of problems, provided that care is taken not to touch live cables to earth (!) and that the advice given in the vehicle’s handbook is followed (especially with regard to sequence of connecting and disconnecting the cables, and relating to specific jump start points that may be provided). If the vehicles being connected together are of opposite electrical polarities, make quite sure that the two cars are NOT allowed to come into contact with each other!! Even if the battery is in good nick, and the engine is cranking at the design speed for starting, in a petrol-powered motor the fuel/air mixture may be difficult to ignite, especially on cold mornings when there is also moisture in the air. Any deficiency in the condition of the ignition coil(s), distributor cap and rotor arm (where fitted) and high tension leads can result in the escape to earth of current which should be reaching the spark plugs. So frequent/regular checks of the ignition system are advisable. The plugs too need to be clean and in good condition. 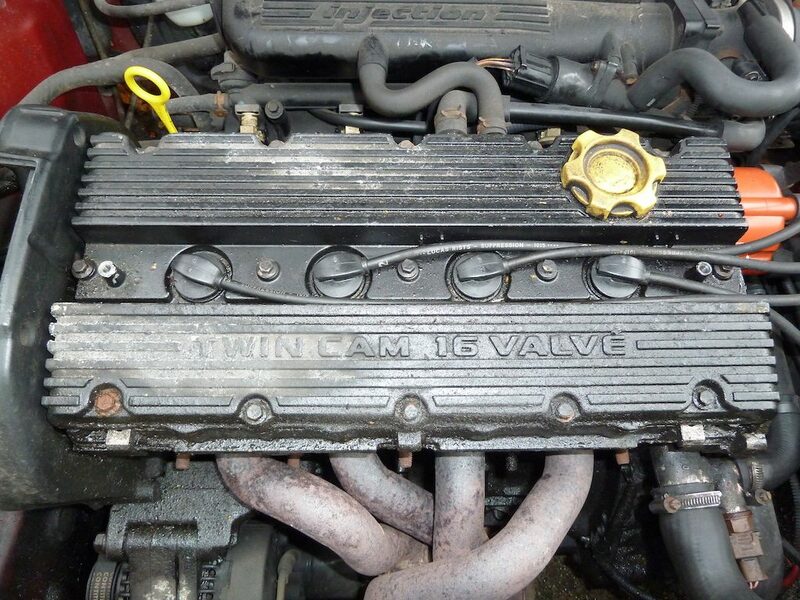 Ensure that the ignition system is in good condition. Of course, if you are a member of a vehicle breakdown service, you may need to call them for assistance to get the car going (although cover at your own home is not always included; check first). However, if your journey is urgent and time is tight you may be able to help yourself get mobile again… (although if you are unsure about your own abilities in this regard, play safe and call a breakdown service/mechanic/vehicle specialist). Flashback to the severely cold winter of 1946-47. My mother and father lived way out in the countryside at the time, and ran a pre-War Austin Seven, which was a very reliable little car but it relied on a six volt electrical system and, with relatively ‘thick’ engine oil, cranking speeds on the starter motor in extreme cold conditions could be ‘borderline’. 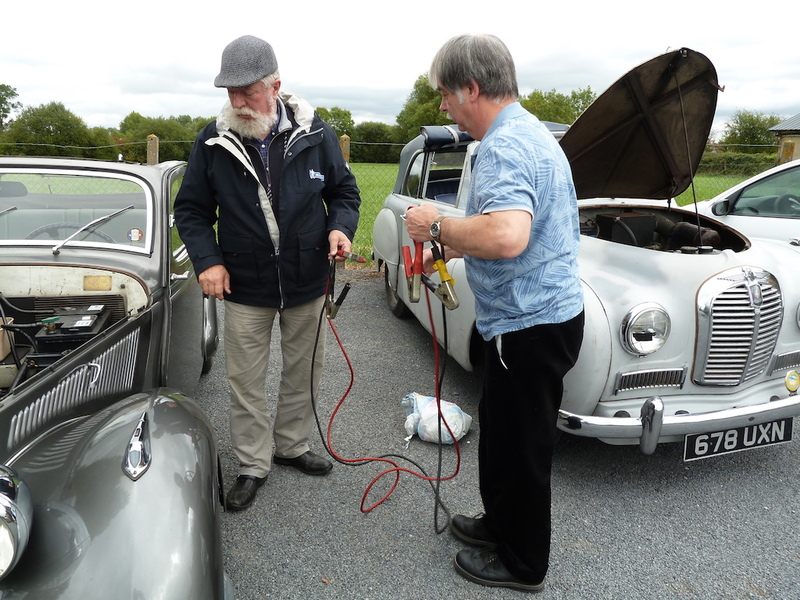 (Thankfully the car also featured a starting handle – invaluable for starting many classic cars, even with an almost completely ‘flat’ battery). One day Mum, who was in the house alone at the time, needed to use the car for an urgent mission, and with below zero temperatures the electrical system was struggling. So she employed a tip that my grandfather taught her… She removed the spark plugs, dried off the excess fuel (resulting from ‘flooding’ with petrol) with a soft cloth and then got the plugs as warm as possible by placing them on a tray in the oven, set at moderate heat. After a few minutes the plugs were hot and were screwed back onto the engine as rapidly as possible before they could cool down, and the engine was tried again. Even with low available battery voltage it fired immediately and the Seven set off through the snow and its mission was accomplished! 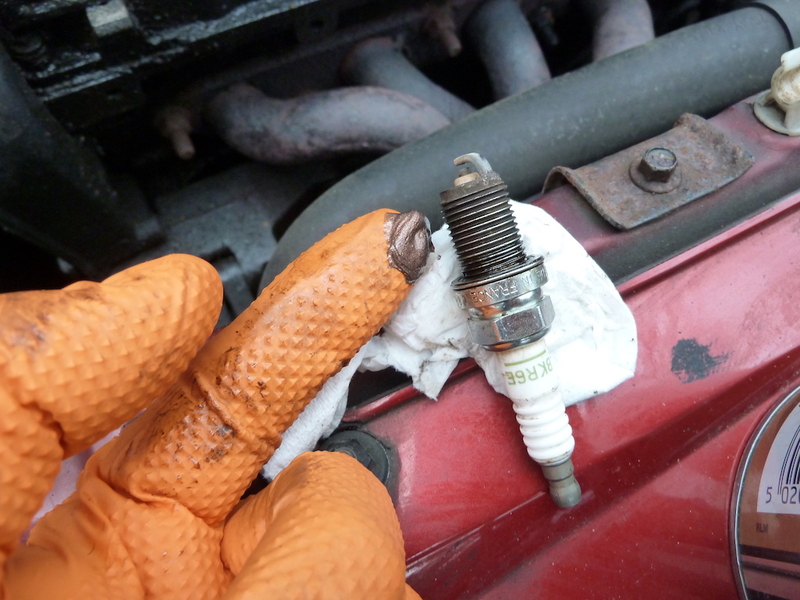 The same technique can be used today of course, since petrol engine still need spark plugs that are clean and dry. Take the greatest of care with all the components when gaining access to the spark plugs, and especially avoid straining/otherwise damaging the high tension leads and ignition coil(s) etc. 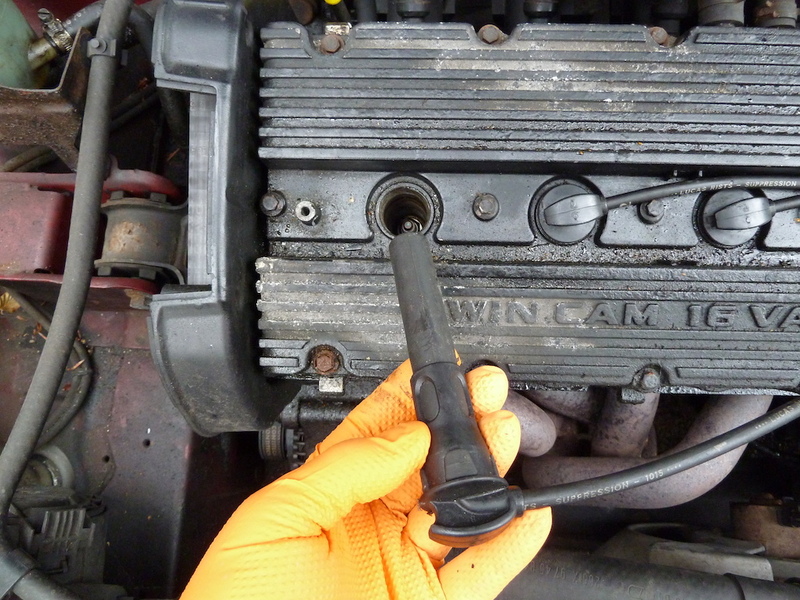 Take care also to avoid putting any sideways pressure on the spark plugs as they are removed/refitted; the ceramic sections can break off and will be VERY difficult to remove from the deep wells in which they are located, on many engines. You may need to remove an access panel – usually screwed or clipped in place –to reach the spark plus (as in this case). Take great care when detaching the high tension connector and lead from each spark plug; a special tool may be needed. 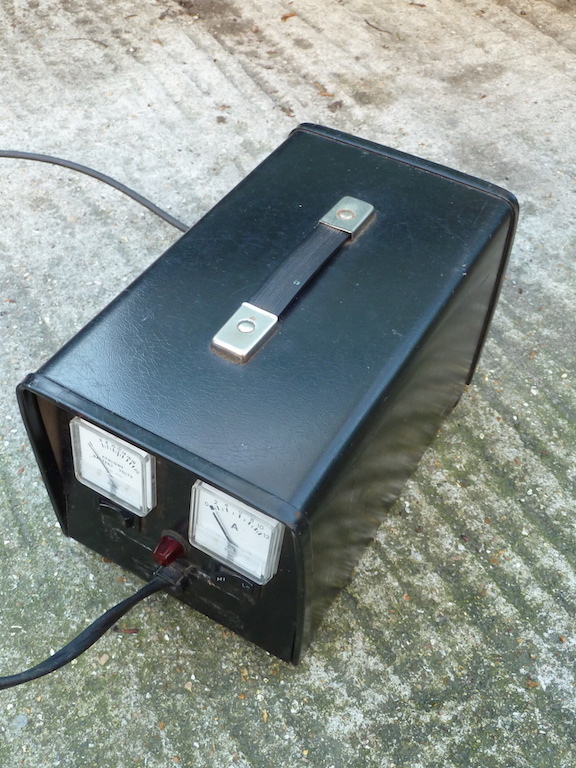 These plugs were carefully heated on a garage heater on a ‘warm’ setting; this did the trick! 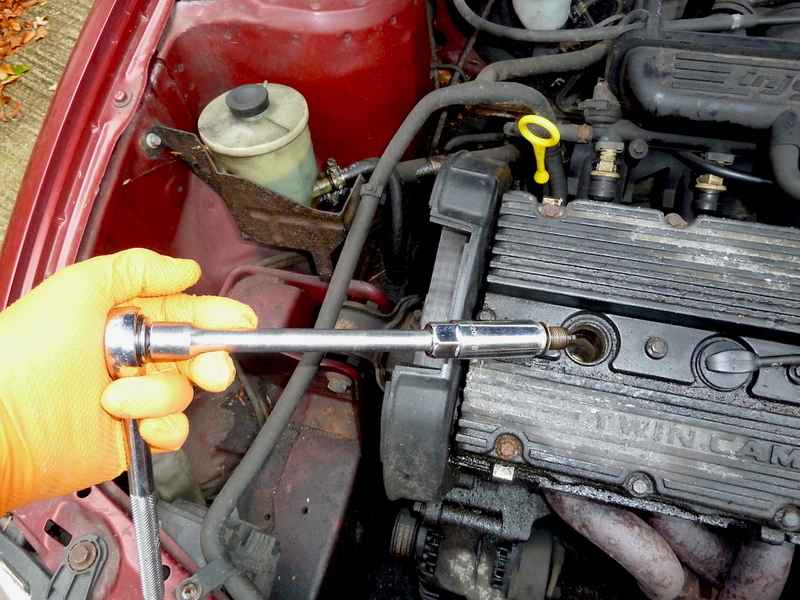 However, FIRST, before removing and heating the plugs… If the car in question is an older model with a choke control, if the engine floods with fuel and the battery has enough power to rotate it fast, push the choke in and gently push the accelerator pedal to the floor (don’t do it rapidly on a vehicle with an accelerator pump or this will squirt further fuel into the engine…) and hold the pedal down while cranking the engine using the starter motor. This should clear the excess fuel and the motor should start. I should also mention that water-dispellant aerosol spray products can be useful on cold, damp days; a quick spray onto the high tension leads, distributor cap and spark plug tops can drive away moisture to help the car start. Another type of product worth having nearby is a ‘rapid start’ spray; introduced to the carburettor or intake tract, in effect this is a highly volatile substance that ignites more readily than petrol within the engine, thus enabling the car to start more easily in difficult conditions. 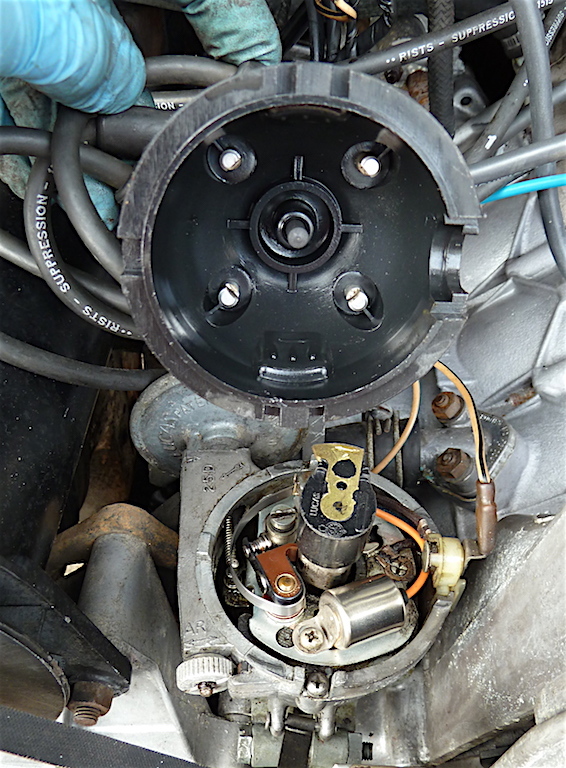 If your car is a more recent vehicle that has a fuel pump activated by turning on the ignition, you may be able to temporarily stem the flow of fuel by removing the fuse serving the fuel pump (the fuse in question may be identified on the fusebox lid, or may be indicated in a diagram found in the handbook). Again by cranking the engine (with the fuse out of circuit) the excess fuel should be dispelled, and hopefully the car will start. 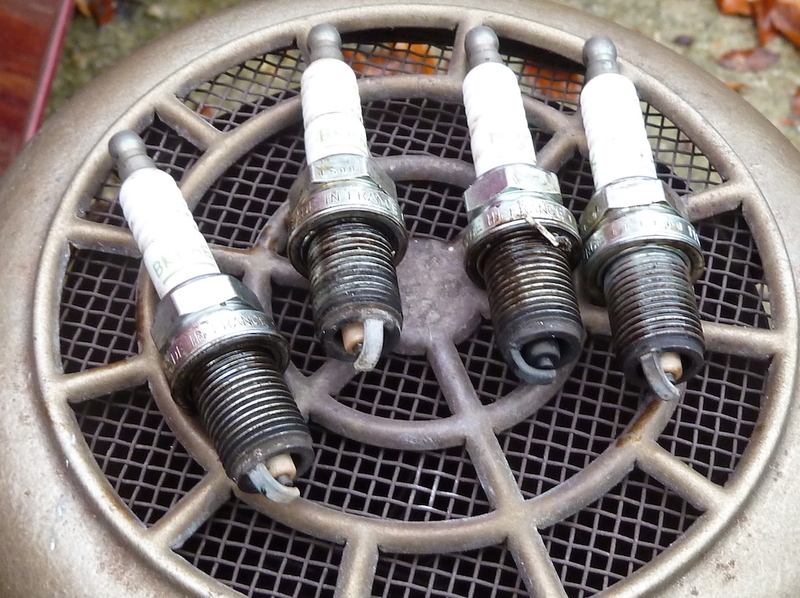 If the car doesn’t start, it is then worth removing the spark plugs, cleaning them, heating them gently and re-fitting them. The application of a little copper-based anti-seize grease on re-installation will help prevent the plugs from seizing, aiding removal in the future. In recent times, using the above techniques (which may be old but they work!) I have a ‘flooded Ford’ to start, so that its owner could get to work, and also persuaded a ‘reluctant Rover’ with low battery voltage to respond. Of course, if there is no obvious reason why the plugs are becoming flooded with petrol, it is essential that further investigation is required to find out why.